The president has yet to visit an American mosque. Ahmed Mohamed’s ordeal is the perfect opportunity to launch a new fight against anti-Muslim bigotry. On Monday afternoon, an unassuming kid—a nerd, a geek, with his glasses and his NASA shirt—was led away from his Irving, Texas, school in handcuffs, for all his classmates to see. A perp walk. His crime was building something that, in the wild imaginations of a security-paranoid society, might be misconstrued as a bomb or, as the police who arrested the young student suggested, a “hoax bomb.” “He kept maintaining it was a clock, but there was no broader explanation,” a police spokesman said, apparently still unsatisfied with the notion that a kid with an engineering hobby would build a homemade device just for telling the hour. By the time of the city officials’ press conference, the story had become a national embarrassment for Irving, for the schools, the politicians, and the police—and yet the department’s spokesman could not fully grasp the simple truth before him. The significance of this misunderstanding—though the word seems a drastic understatement—cannot be chalked up simply to the appearance of the homemade digital clock. Instead, we must look to the student’s identity, his name. The clock was made by Ahmed Mohamed, just 14 years old, a dark-skinned boy of Sudanese extraction. Mohamed’s parents had lived in their Irving house for 30 years. As Mohamed was being arrested, one police officer reportedly said, “Yup. That’s who I thought it was.” Uncowed, the Mohamed family gave their own press conference. “As-salam alaykum,” the young inventor began his remarks, tucking his chin into his chest in a moment of brief shyness before letting loose a grin. Ahmed Mohamed built a clock—“He wakes up with it most mornings,” the boy’s father said—and showed America what time it was. The hour was dark. 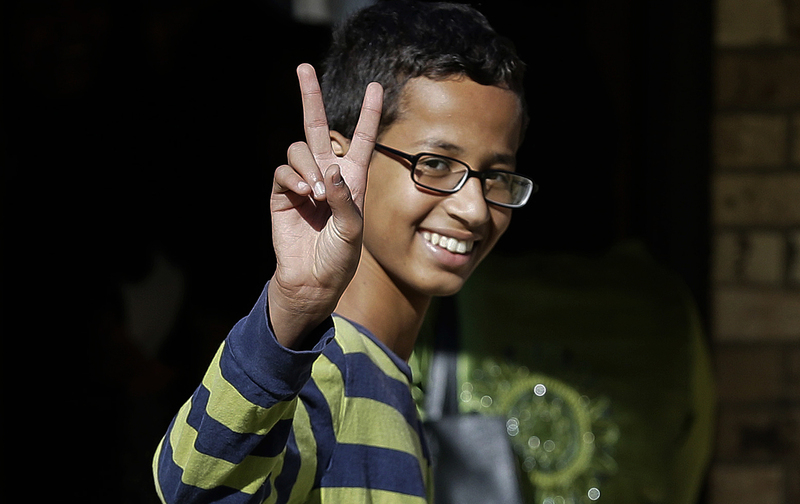 Ahmed Mohamed built a clock and showed America what time it was. The hour was dark. Mohamed’s ordeal shone a spotlight on our national Islamophobia problem. “That is not America,” Mohamed’s father, Mohamed El Hassan, said of the arrest at a Wednesday-afternoon press conference. Sadly, this was very much America—or at least half of America, with most of the Republican Party drinking from the well of anti-Muslim bigotry. “Fifty percent of those who report a great deal of prejudice toward Muslims”—self-proclaimed bigots—”say they are Republicans,” a Gallup poll analysis on the subject of Islamophobia found, “compared with 17% of those who identify as Democrats and 7% as independents.” Just yesterday, anti-Muslim radicals spray-painted racist slogans on a mosque in Kentucky. Earlier this month, vandals burned the shape of a cross into the lawn of an upstate New York mosque. Last month in Nebraska, someone threw a rock through a mosque window. For too long, anti-Muslim bigotry has gone unremarked upon by too many Americans. And despite its having proportionally the fifth-most Muslim residents by state, anti-Muslim sentiment flourishes in Texas. The apathy has allowed hate to creep into the mainstream of politics. Mohamed’s own senator, Ted Cruz, a GOP presidential hopeful, appeared at a rally last week against the Iran nuclear deal organized by one of America’s leading anti-Islam activists, Frank Gaffney. Likewise, Mohamed’s mayor, Beth Van Duyne of Irving, has long recited the chapter and verse of anti-Muslim bigotry. In response to her own misinterpretation of a private group that performs arbitration on civil matters—a misunderstanding no doubt fueled by right-wing media—Van Duyne launched an asinine campaign against Sharia, or Islamic law. She became a hit with Gaffney, appearing numerous times on the notorious birther’s radio show and eliciting defenses from his websites. That Gaffney’s group—and its many allies on the American right—have not been deemed persona non grata in polite company speaks volumes about how far, as a society, we have to go. Have you seen any prominent media reports about GOP presidential candidates kowtowing to Gaffney? Me neither. The right is lost. But what can American liberals do? We have belatedly come to recognize this scourge; the time of tolerating the Marty Peretzes of the world among our own ranks has more or less passed. But too few of our intellectual and political leaders—even President Obama—consistently and directly take on the bigotries of the right. Obama has raised the notion, at the United Nations, among other places, that the U.S. is not at war with Islam. These are welcome sentiments. After Ahmed Mohamed’s clock ordeal, President Obama tweeted, “Cool clock, Ahmed. Want to bring it to the White House?” The invitation is a nice gesture—Mohamed accepted—but it does not go far enough. Dwight Eisenhower and George W. Bush remain the only sitting American presidents to have visited an American mosque; despite the pleas of leaders from the American Muslim community, Obama hasn’t ventured into a Muslim house of worship in the U.S. since assuming office. This is the perfect opportunity. Obama should announce that, in addition to inviting Mohamed to Washington—who would deny the kid a chance to attend NASA’s Astronomy Night at the White House?—he’s taking a trip to Texas to visit the family’s mosque. In Irving, on Mayor Beth Van Duyne’s home turf, this would send a powerful message. It would have the benefit of coming in the wake of an incident of anti-Muslim bigotry, rather than an incident of Muslim terrorism. After Mohamed’s arrest, the Twitter hashtag #IStandWithAhmed began to trend, before going completely viral. This would be the real way to stand with Ahmed: in his home, in his place of worship. And the president should use the occasion to speak frankly on anti-Muslim bigotry. The message isn’t, for once, “We are not at war with Islam”; rather, Obama should declare, We are at war with anti-Muslim bigots. It is past time to name names: Obama should call out the GOP candidates, Frank Gaffney, and the rest of America’s most influential Islam-haters. Such a message would—and forgive my cynicism—be politically useful at this moment as well. Obama’s most notable foreign policy achievement of late is his nuclear deal with Iran, and many of the opponents of the diplomatic accord are steeped in the sort of anti-Muslim invective that has grown all too commonplace at the highest level of office. One would be shading their eyes from reality if they failed to recognize the growing anti-Muslim animus among right-wing pro-Israel forces, extending even to mainstream groups. The leaders of an pro-Israel groups traffic in this messaging—sometimes in softer forms, as the former head of the ostensibly anti-bigotry group, the Anti-Defamation League, did a few years ago. And they draw on the bevy of anti-Muslim bigots when it suits their purpose: for years, the flagship Israel lobby AIPAC—a major opponent of the Iran deal—invited Steve Emerson to speak at its annual conferences, until the embarrassment of Emerson’s serial errors became too great to bear. In its tens-of-millions-dollars campaign to beat the nuke deal in Congress, AIPAC didn’t hesitate to call on “experts” with ties to the Islamophobic fringes. Those to AIPAC’s right are even worse, and their followers among Republicans are legion: the Zionist Organization of America, along with Gaffney’s group, helped organize the anti-diplomacy rally attended last week by Cruz and Donald Trump. Lastly, more liberals—including Obama—ought to focus their ire on Sheldon Adelson and his corrupting, bigoted influence on American politics. Adelson, perhaps the largest Republican mega-donor, was reportedly involved in the distribution of the anti-Islam film Obsession during the 2008 presidential campaign. (Another one of the film’s boosters, Sarah Stern and her right-wing group EMET, helped organize the Times Square rallies against the Iran deal.) Adelson’s corrosive effect on Republican politics is obvious to anyone who looks: GOP candidates hoping for a piece of his billions grovel before him and tailor their messages to match his extreme positions. None of this will end anti-Muslim bias in America—like other pervasive bigotries, it will likely remain strong for some time. But now, with the positive story of a talented boy and his engineering hobby, is an ideal time to launch this fight in earnest. Obama can finally stop hiding from the conspiracy theorists and visit a mosque to celebrate this young man, Ahmed Mohamed. He should call out Mohamed’s haters by name—from the elected officials that represent him and have failed him, like Van Duyne and Cruz, to the mega-donors and political structures that encouraged them in this dereliction of duty. Ahmed Mohamed’s clock has announced that it is time. We should all wake up. Editor’s note: This piece originally stated that George W. Bush was the only sitting American president to have visited an American mosque. Dwight Eisenhower visited the same mosque, the Islamic Center of Washington, in 1957.